Background Depression is associated with clinical coronary events, but the association between history of major depression and subclinical cardiovascular disease in women is not yet known. We determined the association between lifetime history of major depression and subclinical carotid atherosclerosis in middle-aged women. Methods Participants included 336 healthy middle-aged women (one third African American) from 1 of the 7 sites of the Study of Women's Health Around the Nation, a prospective study of the perimenopausal transition. Psychiatric diagnoses were assessed using the Structured Clinical Interview for the DSM-IV Axis I Disorders–Non-Patient Edition. Two measures of subclinical carotid atherosclerosis were assessed using B-mode ultrasonography: plaque and intima-media thickness. Results Lifetime history of major depression was associated with plaque, and substance abuse was related to intima-media thickness. Lifetime history of an anxiety disorder was not associated with either measure. After controlling for standard cardiovascular risk factors, only the association between major depression and plaque was maintained. The risk of plaque was 2-fold in women with a lifetime history of recurrent major depressive episodes relative to women with no history of depression (odds ratio = 2.30; 95% confidence interval, 1.10-4.82). Lifetime history of a single major depressive episode was not associated with plaque. Conclusions Recurrent major depressive episodes may be a risk factor for subclinical atherosclerosis. Prevention of recurrent episodes may also prevent further progression of atherosclerosis. CARDIOVASCULAR DISEASE is the leading cause of death in women older than 60 years.1 However, women tend to be diagnosed as having coronary heart disease 10 to 15 years later than men. When women have a heart attack, their rate of subsequent death or recurrent attack is nearly double that of men.2 Moreover, initial clinical events in women often co-occur with other chronic health problems including diabetes, hypertension, and metabolic disorders, complicating treatment planning and potentially compromising the prognosis. Therefore, a comprehensive understanding of coronary heart disease in women depends on understanding the factors associated with early progression of the disease prior to the clinical manifestation of symptoms. Many asymptomatic individuals have significant underlying atherosclerosis.3,4 To evaluate risk factors for atherosclerosis relatively early in the progression of the disease, B-mode ultrasonography can be used for the measurement of carotid wall intima-media thickness (IMT) and plaque.5 Intima-media thickness and plaque correlate substantially with atherosclerosis in the coronary arteries and predict clinical coronary events in large-scale epidemiological studies.3-6 More important, these measures provide a unique opportunity to understand the risk trajectories associated with atherosclerotic progression prior to the onset of clinical coronary events in otherwise understudied groups, including premenopausal women. It is now generally accepted that standard risk factors (eg, smoking, hypertension, body mass index, cholesterol level, and diabetes) only partially account for coronary morbidity and mortality. Given that biological and behavioral factors cannot entirely account for coronary risk, interest in psychosocial risk factors has mounted. A growing body of literature documents an association between depression and coronary heart disease, independent of standard cardiovascular risk factors. For example, the 1-month prevalence of major depressive episodes in community samples is approximately 5%,7 whereas it is nearly 3-fold higher among patients with coronary heart disease.8 Moreover, depression is associated with a 2- to 4-fold increased risk of coronary death in patients hospitalized with a myocardial infarction.8-11 The link between depression and coronary risk prior to the onset of a clinical event, however, is much less clear. 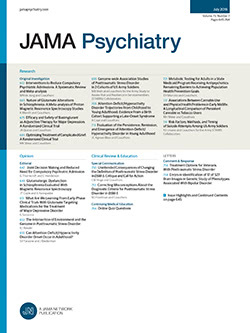 Some community-based studies of symptom-free individuals report that depressive symptoms are associated with an increased risk of a future coronary event,12-15 whereas others do not.16-18 Variability in the findings to date among community-based samples may be due in part to the different measures of depression. With notable exceptions,13,19 studies of initially healthy persons tend to rely on self-report measures of depressive symptoms during the previous 1 to 2 weeks rather than on a structured interview assessing both the severity and chronicity of depressive symptoms. Although current depressive symptoms provide important information about risk for a future major depressive episode,20,21 the chronicity of symptoms may be especially relevant considering the gradual progression of atherosclerosis during the life course. Structured clinical interviews allow the opportunity to examine risk associated with other psychopathologic conditions that can co-occur with major depression, such as anxiety disorders and substance use. Multiaxial assessment of lifetime diagnoses helps to rule out the likelihood that coronary heart disease risk is a function of more general distress rather than major depression in particular. The Study of Women's Health Across the Nation (SWAN) is a multisite, multiethnic prospective investigation of the perimenopausal transition. The administration of the Structured Clinical Interview for the DSM-IV Axis I Disorders–Non-Patient Edition (SCID-IV/NP)22 and ultrasonographic scans of the carotid arteries at 1 SWAN site provided a unique opportunity to examine the link between lifetime history of psychopathologic conditions and subclinical carotid atherosclerosis in middle-aged women prior to menopause. We hypothesized that major depression would be associated with carotid atherosclerosis on B-mode ultrasonography. Specifically, we expected that more long-term exposure to depressive symptoms as evidenced by recurrent major depression would result in a greater risk of carotid atherosclerosis than would a history of a single major depressive episode or current symptoms. To test these hypotheses, we examined lifetime recurrence of major depressive episodes as diagnosed using the SCID-IV, as well as self-reported depressive symptoms during the past week. Additionally, we examined the association between lifetime history of other psychiatric disorders and subclinical carotid atherosclerosis to determine the specificity of risk associated with major depression. Understanding the link between major depression and atherosclerosis in women has important public health implications for the prevention and treatment of clinical cardiovascular events in this relatively understudied group. Participants were drawn from the Pittsburgh, Pa, site of SWAN, a 7-site longitudinal study of the perimenopausal transition. (The other 6 sites did not administer measures of carotid disease and SCID-IV interviews.) Each SWAN site recruited community samples that included white women and 1 designated minority group. White and African American women at the Pittsburgh site were sampled using random-digit dialing and voter registration lists for eligibility interviews. A detailed description of the SWAN study has been published elsewhere.23 Participants were aged 42 to 52 years, had their uterus and at least 1 ovary intact, were not using any hormone preparations, and reported experiencing at least 1 menstrual period in the prior 3 months. To be able to examine predictors of the development of cardiovascular disease, women who were free of clinical cardiovascular disease at baseline were eligible for the carotid study (ie, no history of myocardial infarction, angina, intermittent claudication, cerebral ischemia, or revascularization and no specific medications for hypertension, diabetes, or heart arrhythmia). From the SWAN parent study of 463 participants at the Pittsburgh site, a total of 265 white women and 123 African American women were identified as eligible to participate in the carotid ultrasonography study. Of these individuals, 88.3% of the white women(n = 234) and 89.4% of the African American women (n = 110) participated. Eight of the women who underwent carotid ultrasonography did not receive the SCID-IV at baseline or at the examination 1 year later, yielding 336 women for the current analyses. Blood pressure measurements were obtained by a trained technician with a random-zero sphygmomanometer and were standardized for cuff size, position, and rest period. Two blood pressure readings were obtained for each participant and averaged for use in the analyses. Body mass index was calculated by dividing weight in kilograms by height in meters squared. To ensure quality technician performance and compliance with standard protocol, all SWAN technicians were certified before collecting physical measurements for participants. Certification procedures required that each technician complete training in how to obtain blood pressure readings and physical measurements in accordance with the guidelines of the SWAN coordinating center. Each trainee was then required to obtain physical measurements and blood pressure readings for a series of volunteer participants. Certification required that a trainee's measurements match a trained technician's measurements for the same 2 volunteers within specified guidelines. Lifestyle variables typically associated with cardiovascular disease risk were also assessed. Physical activity was measured with an adaptation of the questionnaire by Baecke et al,28 a self-report instrument that has been used widely in epidemiological research and has documented reliability and validity. An interview-administered version of the food frequency questionnaire developed by Block et al29 was used to assess diet and nutrition, including the nutrients, frequency, and portion sizes of 103 foods. Finally, self-reported smoking history (never, past, and current) was assessed. The SCID-IV/NP22 was administered at the baseline visit to obtain information on current and lifetime diagnoses. The SCID-IV is a semistructured diagnostic interview designed to enable trained physicians to make current and lifetime diagnoses according to the criteria set forth in the DSM-IV.30 The SCID-IV sections on mood disorders, anxiety disorders, and alcohol and non–alcohol substance use disorders were administered in this study. For participants whose first carotid ultrasonographic scan occurred at the first annual follow-up visit, lifetime SCID-IV diagnoses were updated with any new diagnoses that had occurred during the year since baseline. The SCID-IV interviewers were trained clinicians with a masters degree, PhD, or degree in psychiatric nursing. To conduct SCID-IV interviews in the SWAN study, interviewers needed to complete a multistep certification process. They participated in a 2-day training session with staff from the Biometrics Institute at the College of Physicians and Surgeons of Columbia University (New York, NY), the developers of the SCID-IV. Subsequently, each interviewer conducted at least 10 practice interviews using the SCID-IV and co-rated 10 additional interviews. Practice interviews were videotaped and reviewed by the study's principal investigator (J.T.B.). Once the interviewer demonstrated a high level of competence with the administration of the SCID-IV (ie, scoring of symptoms and diagnosis consistent with the study's principal investigator), 1 videotape was sent for review to the Biometrics Institute. External review was conducted to ensure that interviewers met the standards for conducting SCID-IV interviews and making diagnostic decisions established by the developers of this measure. If the first videotape was not satisfactory for certification, subsequent videotapes were sent until certification was achieved. Participants diagnosed as having an untreated Axis I disorder were given a list of referral sources. To ensure quality control, all interviews were audiotaped and randomly selected for review by the team of SCID-IV interviewers at the Pittsburgh site to establish interrater reliability. The κ scores across diagnoses ranged from 0.70 to 0.90, indicating adequate reliability. Because of low rates of certain lifetime diagnoses in our sample, diagnoses were combined as follows: anxiety (composed of panic disorder with or without agoraphobia, agorophobia without panic disorder, social phobia, specific phobia, and obsessive-compulsive disorder), major depression (single or recurrent episodes), and substance use disorders (composed of abuse and dependence). The Center for Epidemiological Studies Depression Scale (CES-D),31 a 20-item screening instrument, was used to assess depressive symptoms during the past 7 days. Responses ranged from 0 (rarely/none of the time) to 3 (most of the time). This scale has been used extensively in population-based studies.31-33 Approximately 20% of people in these studies have scores of 16 or higher and are classified as having probable cases of depression.31,34 The CES-D scores were examined both as a continuous measure of depressive symptoms and with the cutoff of 16 or greater to identify potentially clinically significant symptoms. Carotid measurements were assessed using a scanner (SSA 270A; Toshiba, Tokyo, Japan) equipped with a 7.5-MHz linear array-imaging probe that used 3.5 MHz for Doppler measurements. During the scanning protocol, the ultrasonographer obtained detailed B-mode images of the right and left common carotid arteries, carotid bulb, and the first 1.5 cm of the internal and external carotid arteries. The ultrasonographer imaged the vessel in several planes for each location and then focused on the interfaces required to measure IMT and on the largest area of focal plaque. Both axial and longitudinal scanning were used to identify any areas of focal plaque. Training and certification procedures for ultrasonographers and readers are described in detail elsewhere.37 For ultrasonographer training and certification, the trainee and a certified ultrasonographer performed carotid scans for 5 volunteers, twice within 2 weeks. The resulting 20 scans were scored by a certified reader. The trainee was considered certified when the correlations were .80 or higher and the mean IMT absolute difference was.05 mm or less for both between- and within-ultrasonographer comparisons. Reader training and certification included the trainee independently scoring a standard set of 10 images, with 5 images read twice to assess within-reader variability. These 10 cases were compared with an experienced reader's scores. Readers were certified if correlations of .80 or higher and a mean absolute difference of .05 mm or less were achieved for both between- and within-reader comparisons. Our study used ultrasonographic data from the baseline clinical examination(n = 286) or the follow-up examination 1 year later (n = 50) for participants who did not have carotid scans at baseline. At both the baseline and annual follow-up visits, informed consent was obtained and assessments were completed as follows. At each visit, venipuncture was performed, anthropometric measures were obtained, and questionnaires and interviews pertaining to medical and health history, behavior, and psychosocial factors were completed. Psychiatric history assessments were conducted by a trained clinician. At least 1 carotid ultrasonographic scan was conducted at baseline or follow-up for the subset of eligible women. This study was approved by the institutional review board at the University of Pittsburgh, and participants gave informed consent. The procedures followed were in accordance with institutional guidelines. The IMT scores were normally distributed with no significant outliers. The distribution of plaque scores was positively skewed because relatively few women had evidence of plaque; therefore, plaque was analyzed as a dichotomy. We used t tests, χ2 tests, and nonparametric methods to determine whether there were bivariate associations between lifetime diagnoses and subclinical measures. Statistically significant bivariate associations were subjected to more stringent multivariate analyses controlling for standard cardiovascular risk factors. Standard cardiovascular risk factors were identified using stepwise multiple regression analyses predicting plaque, then IMT. To deal with the issue of multicollinearity, only those risk factors retained in the model at P<.10 were included in the final hierarchical multiple regression analyses. Accordingly, covariates contained in the final model were slightly different for IMT and plaque. P<.05 was considered statistically significant in subsequent multivariate analyses predicting IMT and plaque. Descriptive statistics for demographic characteristics, risk factors, and major study variables are presented in Table 1. Most participants were middle aged, white (67%), and had completed at least some postsecondary education (77%). More than one third of the sample met the criteria for a major depressive episode during their life course, whereas approximately 22% met the criteria for an anxiety disorder and 15% for substance abuse or dependence. Approximately 23% of the participants reported significant depressive symptoms during the past week (CES-D score ≥16). The mean± SD IMT score was 0.64 ± 0.09. Of the participants, 86% had a plaque score of 0, 11% had a plaque score of 1, and 3% had a score of 2 or higher, revealing a relatively healthy sample consistent with age and selection criteria (which included having menses within the last 3 months). Bivariate analyses examining the association between lifetime history of psychopathology and subclinical carotid atherosclerosis are presented in Table 2. Lifetime history of a substance use disorder (abuse or dependence) was significantly associated with a higher IMT score. Lifetime history of major depression was significantly associated with plaque. Specifically, bivariate analyses suggest that a greater proportion of women with a lifetime history of recurrent major depressive episodes show evidence of plaque on carotid ultrasonography than those with a single episode of major depression or women with no history. However, current depressive symptoms (CES-D score ≥16) were not significantly associated with plaque(χ21 = 0.18; P = .70) or IMT (F1,133 = 0.34; P = .50). The pattern of findings was the same when current depressive symptoms were used as a continuous rather than dichotomous variable. Lifetime history of anxiety disorders was not significantly associated with IMT or plaque. Stepwise multiple regression analyses identified which of the standard cardiovascular risk factors were associated with plaque and IMT. Older age(P = .009), higher diastolic blood pressure (P = .005), smoking history (P =.002), and white race (P = .01) were associated with plaque, whereas higher systolic blood pressure, insulin level, and African American race were associated with IMT (P<.001). These variables were then entered into the first level of multivariate analyses predicting carotid atherosclerosis, followed by DSM-IV diagnosis. A history of substance use was not associated with IMT after adjustments for systolic blood pressure, insulin, and race. Conversely, a lifetime history of recurrent major depressive episodes remained significantly associated with plaque after controlling for age, diastolic blood pressure, smoking history, and race. Compared with women who had no history of a major depressive episode, women with a history of recurrent major depression had a 2-fold greater risk of plaque (odds ratio [OR] = 2.29; 95% confidence interval [CI], 1.08-4.86). Alternatively, women with a single major depressive episode were not at greater risk (OR = 0.63; 95% CI, 0.20-1.98). One explanation for our findings might be that women with recurrent major depressive episodes are more likely to engage in behaviors that promote atherosclerotic progression (eg, smoking) or have had greater exposure to pharmacological treatments with potential cardiotoxic effects (namely, tricyclic antidepressants).7,9 As indicated in Table 3, however, we found no significant differences between women with no history of a major depressive episode, a single episode, or recurrent episodes for any of the biological or lifestyle variables associated with coronary heart disease risk. In terms of treatment history, women with recurrent major depressive episodes were more likely to have experienced their first episode at an earlier age and to have sought some type of mental health treatment (psychotropic medication and counseling or talk therapy). To determine whether pharmacological treatment with tricyclic antidepressants mediated the association between recurrent major depression and plaque, we repeated this analysis including current tricyclic antidepressant use as a covariate. The association between recurrent major depression and plaque remained statistically significant after controlling for the use of tricyclic antidepressants (OR = 2.56; 95% CI, 1.18-5.57). Consistent with our hypotheses, we observed a significant association between carotid atherosclerosis and lifetime history of major depression assessed using a structured clinical interview. Women with a lifetime history of recurrent major depressive episodes were more than twice as likely to have plaque on carotid ultrasonography than women with no history of major depression. A single major depressive episode or current depressive symptoms, however, were not associated with an increased risk of plaque. These associations persisted after controlling for standard cardiovascular risk factors. Women with a lifetime history of substance abuse or anxiety disorders were not at increased risk for plaque or IMT in multivariate analyses. Why was an increased risk for plaque specific to recurrent major depressive episodes rather than to depressive symptoms or the occurrence of any episode of major depression? Our findings are consistent with a growing body of empirical research highlighting a greater risk of coronary heart disease for those with more chronic or severe depressive episodes.13,19,38 In their community-based longitudinal study of depression and cardiac mortality, Penninx et al19 reported that compared with nondepressed cardiac patients, the relative risk of subsequent cardiac mortality was nearly doubled in cardiac patients with major depression (defined according to DSM-III39 criteria) relative to cardiac patients with elevated depressive symptoms (defined by CES-D scores ≥16) after adjustment for standard risk factors. The same pattern of findings was reported for participants without cardiac disease at baseline. Similar findings were reported by Pratt et al13 in their prospective study of major depression and risk of incident myocardial infarction in a community sample of people with no cardiac symptoms at baseline. Compared with participants who had no history of depressive symptoms, the risk of myocardial infarction 13 years later was twice as great in those with depressed mood or anhedonia and 4 times greater in participants with a history of a major depressive episode independent of major coronary risk factors. Future research examining subclinical carotid atherosclerosis as well as clinical cardiovascular events should assess the severity and chronicity of depressive symptoms during the life course to accurately capture risk status associated with depression. What mechanisms might explain the observed association between recurrent major depressive episodes and increased risk of plaque? Considerable evidence indicates that depression has both behavioral and pathophysiological effects that may increase the risk of cardiovascular disease in depressed individuals.8-11 In terms of behavioral mechanisms, depression is associated with specific behaviors that modulate the progression of cardiovascular disease. Depressed individuals sleep and exercise less, have poorer diets, and smoke and use alcohol and other drugs more than nondepressed individuals.40,41 Although we found no significant differences in these risk behaviors among the groups with absent, single, or recurrent major depressive episodes (Table 3), our data, other than for smoking (never, past, or current), are limited to current health and behavioral risk factors. Whether a lifetime history of behavioral risk factors varies according to depression status and accounts for an increased risk of plaque in women with recurrent major depressive episodes should be the focus of future research. Moreover, some researchers have suggested that tricyclic antidepressants may have a cardiotoxic effect.42 As demonstrated in our post hoc analyses, women with a history of recurrent depression are more likely to have received pharmacotherapy during the life course. However, consistent with the shift in treatment trends from tricyclic antidepressants to other drug categories, only 6 (1.8%) of the participants reported a current use of tricyclic antidepressants. Given that tricyclic antidepressants were so rarely prescribed to the participants in our sample, it is unlikely that these suspected cardiotoxic effects could account for our findings. Accordingly, statistically controlling for tricyclic antidepressant use in our analyses did not change the pattern of findings. Direct pathophysiological effects of depression have also been reviewed elsewhere.8 In brief, depression is often accompanied by hypercortisolemia43 and impaired platelet function.44,45 Depressive symptoms have been linked to impaired vagal control in patients with coronary artery disease,46 as well as reduced heart rate variability in healthy men and women.47,48 Cumulative long-term exposure to the proposed pathophysiological effects of depression may accelerate atherosclerotic progression in women with recurrent major depressive episodes relative to women with a single episode or current depressive symptoms alone. Determination of the specific pathophysiological alterations associated with recurrent major depression is an important direction for future research. It is essential to remember, however, that correlation does not necessarily imply causation. It is conceivable that a third factor may predict both recurrent major depressive episodes and plaque development. Additionally, although the use of the SCID-IV22 provided a retrospective account of lifetime history of major depressive episodes, prospective studies are necessary to establish the directionality of the obtained effects. Our findings were also limited to only 1 subclinical outcome: plaque. This may have occurred because plaque is a more direct measure of the atherosclerotic disease process, whereas IMT is related more to vascular aging. Finally, caution should be exercised in generalizing our findings to other ethnic groups and women in other age groups, particularly because the prevalence of a single major depressive episode in our study was higher than that obtained in other groups. Our rates may be higher because SWAN participants have become accustomed to revealing intimate, personal information to the interviewers in our ongoing longitudinal study. Alternatively, there could be a selection bias; women who were willing to participate in a time-intensive, longitudinal study like SWAN may have more depressive symptoms. The prevalence of recurrent depression in our sample, however, was comparable with the overall rates of major depression obtained in the National Comorbidity Survey49 with similarly aged women. Finally, we did not have information regarding participants' lifetime use of tricyclic antidepressants. Given that women with recurrent major depression or who have more extensive psychiatric treatment histories may be more likely than those with a single or current episode to have been prescribed a tricyclic antidepressant, future research should attempt to determine whether a lifetime history of tricyclic antidepressant use increases vulnerability to carotid atherosclerosis. The strengths of our study also merit attention. Women were recruited into SWAN using random-digit dialing and voter's registration lists of age-eligible women in Allegheny County, Pennsylvania, increasing our confidence in the generalizability of these findings. We used a reliable technique for assessing subclinical cardiovascular disease: B-mode ultrasonography of the carotid arteries. This provided the opportunity to examine women very early in the progression of the disease. In addition, the assessment of subclinical atherosclerosis avoided a potential problem in determining the direction of the association between recurrent major depression and plaque. Participants' awareness of their illness and associated symptoms could potentially perpetuate or exacerbate depressive symptoms in cross-sectional studies that focus on clinical disease. We also examined lifetime history of psychopathological characteristics as diagnosed with the SCID-IV. The progressive nature of the atherosclerotic disease process suggests that measures of depression should assess long-term or lifetime exposure to these disorders rather than only current episodes or depressive symptoms. Building on the work of Pratt et al,13 the use of the SCID-IV in this study strengthened the argument that cardiovascular risk may be specific to depression rather than to a more general history of psychopathology, a distinction that has been inadequately evaluated in the literature.17 Finally, SCID-IV interviewers and carotid ultrasonographers were blind to one another's findings, eliminating the possibility of spurious effects due to rater bias. Our findings have significant treatment implications. Women are nearly twice as likely as men to have a lifetime episode of depression, with 1 in 5 women experiencing a major depressive episode at least once in her lifetime.50-52 For many women, depression is a recurrent condition, severely impairing social and occupational functioning and quality of life. Identification of women with recurrent major depressive episodes may have important public health implications for the early identification of subclinical atherosclerosis and prevention of more advanced cardiovascular disease. Prevention and intervention efforts targeting the cognitive factors and behaviors that predispose women to recurrent depressive episodes may decrease the likelihood of future episodes, improve quality of life, and enhance both mental and physical health. In conclusion, we examined lifetime history of major depression, anxiety disorders, and substance use disorders as well as subclinical atherosclerosis in a community sample of healthy women at midlife. We report for the first time that recurrent major depression, but not current depressive symptoms or a single episode of major depression, is an important risk factor for carotid plaque early in the natural history of atherosclerosis in healthy middle-aged women. Future research should determine whether behavioral and pharmacological treatments to prevent the recurrence of major depressive episodes also prevent atherosclerotic progression and subsequent risk of coronary heart disease. Corresponding author and reprints: Karen A. Matthews, PhD, Department of Psychiatry, University of Pittsburgh Medical Center, 3811 O'Hara St, Pittsburgh, PA 15213 (e-mail: matthewska@msx.upmc.edu). Submitted for publication November 12, 2001; accepted June 6, 2002. This study was supported by grant AG12546 from the National Institute on Aging (Bethesda, Md), which funds research conducted at the University of Pittsburgh (Pittsburgh, Pa) as part of the ongoing, multisite SWAN. Funding for the larger SWAN study was provided by the National Institute on Aging, the National Institute of Nursing Research, and the Office of Research on Women's Health (Bethesda). Supplemental funding was provided by the National Institute of Mental Health, the National Institute of Child and Human Development, and the Office of AIDS Research (Bethesda), and the National Center on Complementary and Alternative Medicine (Gaithersburg, Md), all of whose support is gratefully acknowledged. SWAN sites and grant support include the following: (1) clinical centers: University of Michigan, Ann Arbor (U01-NR04061), Massachusetts General Hospital, Boston (U01 AG12531), Rush University, Rush-Presbyterian-St Luke's Medical Center, Chicago, Ill (U01 AG12505), University of California, Davis/Kaiser Permanente, Oakland (U01 AG12554), University of California, Los Angeles (U01 A12539), University of Medicine and Dentistry–New Jersey Medical School, Newark (U01 AG12535), and the University of Pittsburgh, Pittsburgh (U01 AG12546);(2) the central laboratory: University of Michigan, Ann Arbor (U01 AG12495); and (3) the coordinating center: New England Research Institutes, Watertown, Mass (U01 AG12553).